Finding a trip-worthy coffee shop was part of a day trip during our early October trip to the Great Smoky Mountains. The government shut-down had closed our favorite national park. As an alternative to visiting our usual haunts, we made Gatlinburg, Tennessee, home base for four nights and explored mountain towns and scenery outside the park. 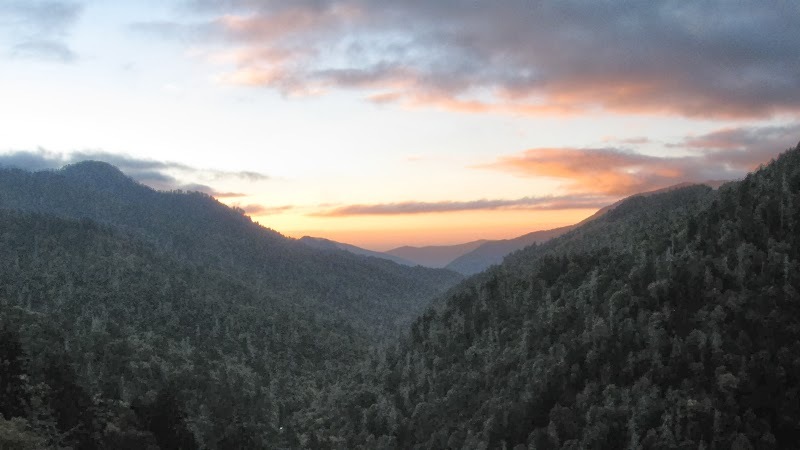 Husband Walter had taken us on a scenic and narrow, winding, steep, backwoods mountain road. It eventually intersected with a major highway. We made our way to Waynesville, North Carolina, a mountain town where we had visited a local art association’s gallery and had taken in some of the town’s whimsical public art on a previous trip. 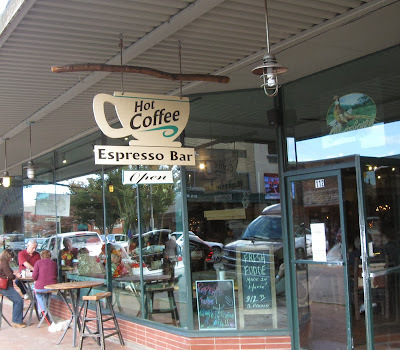 But on this visit, coffee for him and hot tea for me in “just the right” coffee shop was the objective. Finding an interesting coffee shop that fits his idea of comfy, cozy and with hometown appeal qualifies as sightseeing in Hubby’s travel plans. 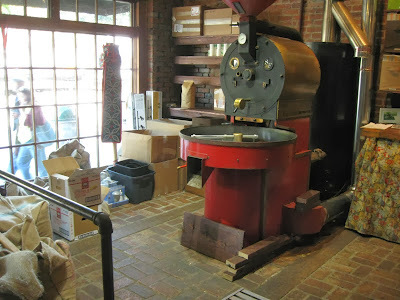 In Waynesville he checked out two coffee shops on Main Street. They were attractive but not his cup of tea, uh, coffee. 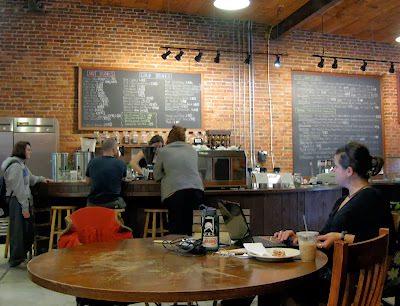 To my surprise, a love of coffee shops had turned my reserved spouse into a chatty traveler. He did not hesitate to accost individuals for recommendations about the coffee shop choice of locals. Thanks to a Waynesville pair, who both happened to be non-coffee drinkers, we wound up at Panacea Coffee House Cafe and Roastery. It was ju-u-u-st right! Staffed by friendly, conscientious baristas and at home in one-half of an old warehouse, Panacea invited patrons to linger, enjoy, and become part of the Panacea community. The warehouse was in what had been the commuity’s industrial district from the late 1880s until the late 1940s. The building’s industrial origins welcomed us at the entry with a historical plaque outside, commercial coffee roaster just inside the door and coffee beans in burlap sacks deposited around inside near the roaster, ready for roasting. 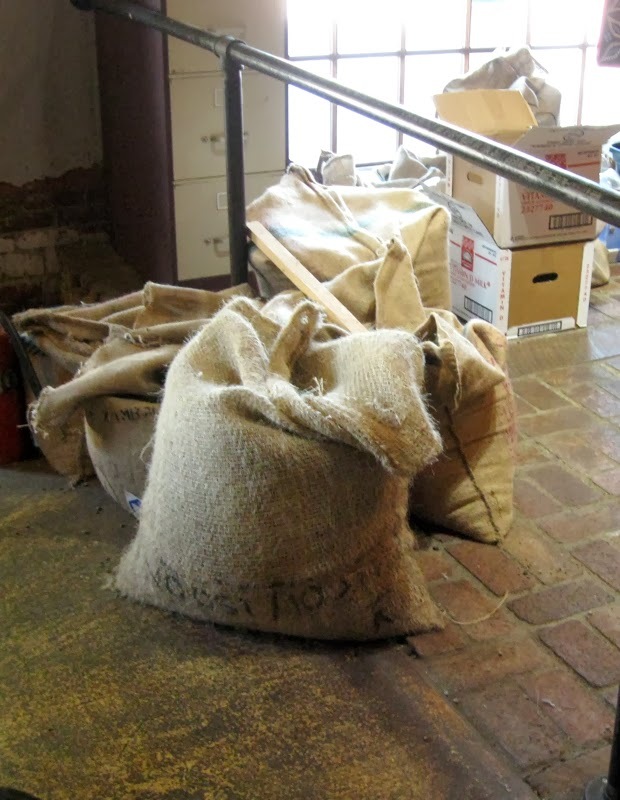 Beans in burlap bags sit handy to the roaster. Old brick walls, concrete floors and a rustic wooden ceiling with exposed beams contributed to the distinctive atmosphere. 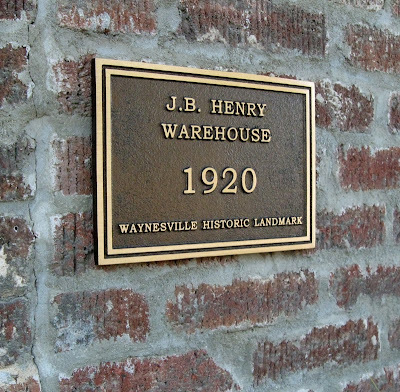 The establishment’s Web site said the owners did their best to preserve as many historical features as possible. It appeared that their efforts had paid off. 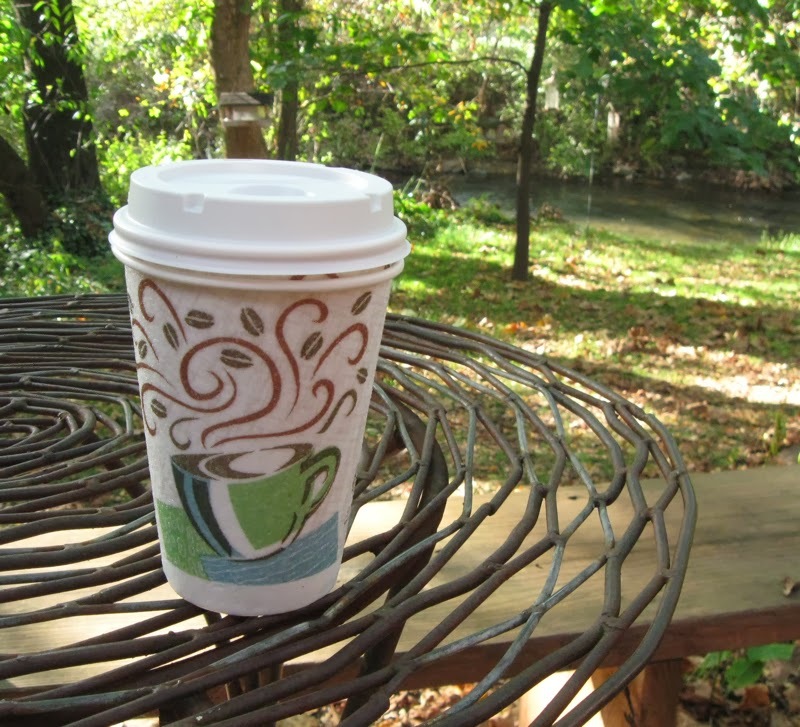 The addition of a deck in the back ratcheted our coffee shop experience over the top. It offered a pleasantly cool temperature, a canopy of trees and a view and sounds of the creek just a few yards away. We settled on the deck and enjoyed our hot drinks. Mission accomplished. Hubby had his fix. A couple more treats awaited us on our return trip to Gatlinburg. We pulled off near the national park’s Ocunaluftee Visitor Center to indulge in a little elk-watching. We admired the huge antlers of the males in the adjacent meadow then pulled back onto Newfound Gap Road. By the time we passed Newfound Gap, the setting sun prompted us to pull off the highway at the Morrow overlook. A nice place to relax! It looks so much like one of our coffee houses, The Mud House. David and I never drink coffee at Starbucks or any other coffee shop. I guess we prefer home brew because it is less expensive. Lol. Your narrative and photos are quite attractive, though. How delightful, Linda. I love those special trips where discoveries are part of the adventure. Hubby and I had the worst Chai tea lattes we have ever had at a local Peet's coffee place. Now I'm hankering for some "good stuff". The smell in that coffee shop must have been heavenly. Sounds like you had a very good day.